Aryannezhad, M., Behmadi, H., Saadati, S., Poormorteza, N., Amini Moghaddam, Z. (2017). Synthesis and Characterization of Novel Photoactive ‎Poly(ether-amide)s Based on Highly Substituted ‎Phenanthrimidazole. Iranian Journal of Chemistry and Chemical Engineering (IJCCE), 36(6), 69-76. Maryam Aryannezhad; Hossein Behmadi; Seyed Mahdi Saadati; Narges Poormorteza; Zahra Amini Moghaddam. "Synthesis and Characterization of Novel Photoactive ‎Poly(ether-amide)s Based on Highly Substituted ‎Phenanthrimidazole". Iranian Journal of Chemistry and Chemical Engineering (IJCCE), 36, 6, 2017, 69-76. Aryannezhad, M., Behmadi, H., Saadati, S., Poormorteza, N., Amini Moghaddam, Z. (2017). 'Synthesis and Characterization of Novel Photoactive ‎Poly(ether-amide)s Based on Highly Substituted ‎Phenanthrimidazole', Iranian Journal of Chemistry and Chemical Engineering (IJCCE), 36(6), pp. 69-76. Aryannezhad, M., Behmadi, H., Saadati, S., Poormorteza, N., Amini Moghaddam, Z. Synthesis and Characterization of Novel Photoactive ‎Poly(ether-amide)s Based on Highly Substituted ‎Phenanthrimidazole. 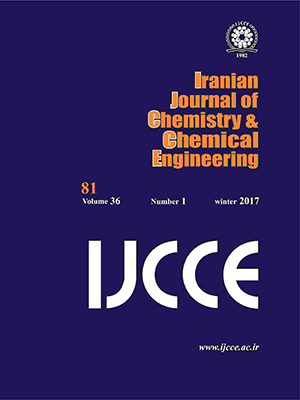 Iranian Journal of Chemistry and Chemical Engineering (IJCCE), 2017; 36(6): 69-76. A new aromatic diamine monomer containing ether linkage based on the phenanthrimidazole ring, ‎1,1´-(4,4´- oxy bis(1,4-phenylene))bis(2-(4-aminophenyl)-1H-phenanthro[9,10-d]imidazole) was synthesized through four-‎components condensation of 4,4´-diamino diphenyl ether, 4-nitrobenzaldehyde, phenanthrene-9,10-dione and ammonium ‎acetate in presence of acetic acid, followed by palladium-catalyzed hydrazine monohydrate reduction. This new monomer ‎was further confirmed by FT-IR, 1H NMR, and 13C NMR spectroscopy. A series of new aromatic polyamides containing ‎phenanthrimidazole ring in the main chain was prepared by direct polycondensation of the prepared diamine with four ‎commercially available aromatic and aliphatic diacids. These polymers are essentially amorphous and were soluble in polar ‎aprotic solvents such as DMF, NMP, DMAc, and DMSO. Inherent viscosities of polyamides were in the range 0.42–0.53 ‎dL/g indicating the formation of medium molecular weight polymers. Polyamides exhibited glass-transition temperature (Tg) in ‎the range 260-280 °C. The 10% weight loss temperature in air atmosphere measured by TGA was in the range 454-526 °C ‎indicating their good thermal stabilities. The photophysical properties of diamine and polyamides were investigated by UV-Vsible and fluorescence spectroscopy. Mallakpour S., Taghavi M., A Facile, Microwave-Assisted Synthesis of Novel Optically Active Polyamides Derived from 5-(3-methyl-2-Phthalimidylpentanoylamino)Isophthalic Acid and Different Diisocyanates, Eur. Polym. J., 44 (1): 87-97 (2008). Majo M.A., Alla A., Bou J.J., Herranz C., Munoz-Guerra S., Synthesis and Characterization of Polyamides Obtained from Tartaric Acid and l-Lysine, Eur. Polym. J., 40 (12): 2699-2708 (2004). Behniafar H., Banihashemi A., Synthesis and Characterization of New Soluble and Thermally Stable Aromatic Poly(amide-imide)s Based on N-[3,5-bis(N-trimellitoyl)phenyl]phthalimide, Eur. Polym. J. 40 (7): 1409-1415 (2004). Cui X., Li W., Yan D., Yuan C., Di Silvestro G., Synthesis and Characterization of Polyamides X 18, J. Appl. Polym. Sci., 98 (4): 1565-1571 (2005). Hearle J.W.S., ‎"‎High-Performance Fibres", Woodhead Publishing Ltd, Cambridge (2001). Mark H.F., "Encyclopedia of Polymer Science and Technology", Wiley Interscience, 12 Volume Set, 3rd Edition, New York (2004). Imai Y., Recent Advances in Synthesis of High-Temperature Aromatic Polymers, React. Funct. Polym., 30 (1-3): 3-15 (1996). Liou G.Sh., Fang Y.K., Yen H.J., Synthesis, and Properties of Noncoplanar Rigid-rod Aromatic Polyamides Containing Phenyl or Naphthyl Substituents, J. Polym. Res., 14 (2): 147-155 (2007). Amini Nasab S.M., Ghaemy M., Synthesis and Characterization of New Polyamides and Polyimides Containing Dioxypyrimidine Moiety in the Main Chain with Bulky Imidazole Pendent Group: Solubility, Thermal and Photophysical Properties, J. Polym. Res., 18 (6): 1575-1586 (2011). Ghaemy M., Alizadeh R., Behmadi H., Synthesis of Soluble and Thermally Stable Polyimide from New Diamine Bearing N-[4-(9H-carbazol-9-yl)phenyl] Formamide Pendent Group, Eur. Polym. J., 45 (11):3108-3115 (2009). Sava I., Iosip M.D., Bruma M., Hamciuc C., Robison J., Okrasa L., Aromatic Polyamides with Pendent Acetoxybenzamide Groups and Thin Films Made Therefrom, Eur. Polym. J., 39 (4): 725-738 (2003). Faghihi Kh., Mozaffari Z., New Polyamides Based on 2,5-bis[(4-carboxyanilino) carbonyl] Pyridine and Aromatic Diamines: Synthesis and Characterization, J. Appl. Polym. Sci., 108 (2): 1152-1158 (2008). In I., Kim S.Y., Soluble Wholly Aromatic Polyamides Containing Unsymmetrical Pyridyl Ether linkages, Polymer, 47 (2): 547-552 (2006). Abdolmaleki A., Novel Aromatic Poly(amide-hydrazide)s Based on the Bipyridine. Part I: Synthesis, Characterization and Thermal Stability, Polym. Degrad. Stab., 92 (2): 292-298 (2007). Bottino F.A., Di Pasquale G., Scalia L., Pollicino L.A., Synthesis and Characterisation of New Polyamides Containing 6,6′-oxy or 6,6′-Carbonyldiquinoline Units, Polymer, 42 (8): 3323-3332 (2001). Bottino F.A., Di Pasquale G., Pollicino A., Scalia L., Synthesis and Characterization of New Polyamides Containing 6,6′-Methylenediquinoline Units, Polymer, 39 (20): 4949-4954 (1998). Saadati S.M., Mosslemin M.H., Behmadi H., Shams A., Synthesis, Characterisation and Fluorescence Studies of New Bis-phenanthrimidazole Derivatives, J. Chem. Res., 37 (8): 487-512 (2013). Yamazaki N., Higashi F., Kawataba J., Studies on Reactions of the N-phosphonium Salts of Pyridines. XI. Preparation of Polypeptides and Polyamides by Means of Triaryl Phosphites in Pyridine, J. Polym. Sci. A: Polym. Chem., 12 (9): 2149-2154 (1974). Dey J., Dogra S.K., Dual Fluorescence in 2-(4’-N,N-Dimethylamino-phenyl)benzazole and its Benzimidazole Analog – Effect of Solvent and pH on Electronic Spectra, J. Phys. Chem., 98 (14): 3638-3644 (1994).